The White Paper on Population projected a population of 6.5 million by 2030, with a bigger proportion of migrant workers than at present - a prospect that alarmed many. Yet in 20 years' time, far from worrying about a big influx of migrant workers, Singaporeans may be grappling with the problem of how to recruit the minimum numbers needed to sustain services and an economy in "just ticking over" status. The growth rates of other countries in the region, including the Philippines and Indonesia, are reducing the development gap between themselves and Singapore. Rising living standards and expanding employment opportunities for their citizens will reduce pressure to seek work abroad: this has already begun to happen. In most countries from which Singapore attracts workers, the promise of regular work that allowed them to support their families would be enough to persuade them that the advantages of staying in their own homelands outweigh those of working abroad. These countries are moving towards meeting that condition, just as South Korea did in the 1980s: before long, China will become a net labour importer. It would, therefore, be unwise to plan on the assumption of the continued availability of low-cost foreign manpower. It will shrink, with far-reaching consequences. Wages and conditions will have to be improved significantly to make jobs that locals do not now want to do attractive to both migrant workers and locals. The resulting rise in employers' costs will spur efforts to raise technological levels and productivity. The threshold of affordability for the employment of domestic workers will rise, forcing the pace in the development of alternatives. Coping will require changes in policy and public attitudes towards migrant workers. The primary goal of most migrants working abroad is to support their families. At the very minimum, they want to be paid their due on time. Before achieving a net gain from their employment, most male workers must work at least a year to recover their placement costs and domestic workers, about eight or nine months. These expenses should be drastically cut, mainly through Singapore-home country government cooperation in tackling excessive charges. Migrant workers stand the best chance of making their investment worthwhile when they can be employed over a period of several years. They benefit more if long service and skill acquisition carry pay increases. This coincides with Singapore's development needs. The government wants to raise productivity. Migrant workers can be part of the process if trained in appropriate skills that are then applied - not simply used to gain a levy reduction. The impact of enhanced skills can be amplified by maintaining relatively stable workforces that become accustomed to teamwork, rather than being perpetually disrupted by rapid turnover. A more contented migrant worker force will be more productive. Enhanced productivity should curb demand for workers. Longer-staying migrants are likely to adapt to Singaporean behavioural norms, easing frictions that currently arise over issues such as littering. To create this "new normal", a number of measures would be needed. The requirement that workers be attached to specific employers and need their consent to transfer to others should be scrapped. Assuming that present demographic priorities remain unchanged, the goal of ensuring that workers return home at the end of their employment in Singapore can be fulfilled through border controls and employment records, aided by the latest technology in personal documentation. With easier labour mobility and workers having a reasonable time to find new employment (perhaps a month), companies could more readily fill their complement of migrant workers from those already in the country, while providing workers who are keen to work and earn with the opportunity to do so. Contracts setting forth clear and equitable conditions for both workers and employers might assist worker retention: they could including undertakings by workers to remain with an initial employer for a specified minimum period, providing that the employer honoured the contract terms. With a restrictive policy on new recruitment in place and strict enforcement of the law against employers demanding payment to hire workers or renew their contracts, companies that treat and pay employees decently, in full and on time could expect to hold workers; only those who profit from rapid labour turnover or short changing their workers would lose. Greater opportunities to find steady long-term employment would incentivise workers to sign on for a series of contract terms, securing them a better return on their labour abroad and retaining their skills and experience for Singapore's benefit for perhaps 10 years or more. In the shorter term, workers whose employers terminate their hire early other than for dishonest or criminal behaviour should be able to seek work with other employers for the duration of their original work permits, which should then normally be renewable. While awaiting case settlement, workers with minor injuries should be allowed to resume working once their long-term incapacity has been assessed for compensation purposes and they are judged fit to work. Workers who come to Singapore on the promise of a job that does not exist, or with employers who do not have full time work for them, should be allowed to seek alternative employment. The overall approach to migrant workers in Singapore should be integrationist, not exclusionary. This would mean encouraging their participation in community initiatives, adjusting housing policy, and unions making an effort to recruit and represent them - all doable with a more stable, longer stay migrant workforce. The introduction of a minimum wage that would protect all workers in Singapore from gross exploitation and allow them to pay their way through their earnings within normal working hours is necessary. New approaches to domestic work are needed. Employers' interests would be best met by focusing on their primary reasons for needing a worker, rather than seeking general purpose domestic workers. This calls for the training and recruitment of care workers, for children, the elderly, or disabled; the workers should be paid as skilled personnel and expected to prioritise care work over any other responsibility. Live-out domestic workers should become an option: they might work in one home or several, at one task or many, but for regular wages and with a cap on working hours. They would stay in hostels or rented accommodation. The possibility of gaining citizenship should be created for workers employed in Singapore on a long-term basis. There might be a minimum 10-year qualifying period, with a clean legal record and a citizenship test. Singapore anticipates a continuing need for workers to fill gaps in its labour force, and this would be a source of working citizens acclimatised to its social, cultural and legal norms, with years of contributing to the economy ahead of them. 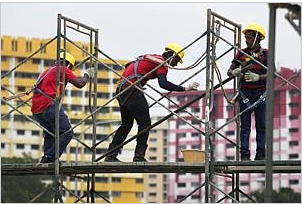 It is possible for Singapore to manage its migrant worker policies in such a way that citizens' existing concerns about migrant worker numbers and their impact on local jobs and incomes are assuaged and that migrant workers' rights are respected. Taken together, measures such as those suggested should result in a reduced requirement for migrant labour, combined with better conditions for the migrant workers who do come to Singapore, to the benefit of all.